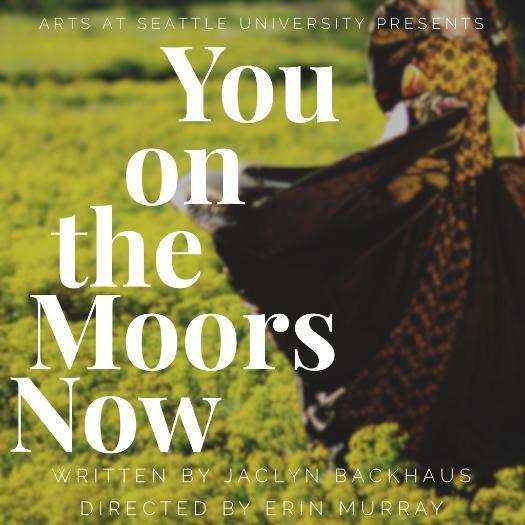 You on the Moors Now is a modern play written by Jaclyn Backhaus which depicts female protagonists and their male romancers from classic literature as Wuthering Heights by Emily Brontë, Jane Eyre by Charlotte Brontë, Little Women by Louisa May Alcott, and Pride and Prejudice by Jane Austen. The women are fleeing from their suitors who do not understand what they’ve done to discourage these women. It turns the original and beloved romance stories upside down and forces them into a new perspective. The play follows the main female protagonists of each novel as they run from the men who just proposed to them. The show seems out of time, with modern slang incorporated throughout the script and the costumes a blend of period conscious pieces and modern, typically 80s inspired wear. It was fun to watch and gave the production a sense of being out of time, as though it can be set anytime. The use of a live DJ was also cool, as the music and sound effects were much more in your face with the DJ being so visible to the audience. It was a cool way to create a new world outside of the ones from which the characters came. The best part of the whole show was the chaotic fight scene as the Moors War came to a head. The second I heard that music and the call of “mambo!” from West Side Story, one of my go-to musicals, I was immediately sold on anything that was about to happen. The rapid music and light changes as well as random dance scenes and the characters comparing war to childish things, saying it’s “like Ninja Turtles”, “double-dutch”, and “wet willies” all contributed to a new feeling an all I could lean and whisper to the friend that accompanied me was that the entire scene was exactly like being in my brain. The odd concepts brought up in this scene as well as intricate choreography and lifts made it incredibly interesting and something I hadn’t really seen before in theater. I also really enjoyed the idea of turning the stories upside down and featuring the men who proposed as some sort of, for lack of a better word, villain as the men viewed themselves as misunderstood Nice Guys who have been wronged by the whole world, a highly topical concept in the age of calling out men for their actions. Each man I could see reflected in a guy I have known in the real world. I kept giving my friend that attended with me knowing looks, as if to tell him “don’t you act like this ever.” This is the time when women are telling men “no” and placing value in their own selves while calling out men who do not respect that choice. It was presented in way that was easy to understand and fun to watch, despite the deeper subject matter. I also liked how the main characters were all reunited and forgave one another after seeing how each has grown, although I don’t know if I’ll do the same. It made the original tales feel different to me and the ending made the beginning that much more compelling. If we call people out for not being respectful of others, we should also address when they begin to learn from their mistakes and failures and learn to respect others. Not everyone deserves forgiveness, but sometimes it can be earned. This is not a message I often see, so it was refreshing to see the men learn that they need to be better people and the women acknowledging that they have become better. You on the Moors Now is a successful and gentle modern retelling of beloved romance stories that combines many interesting facets of several types of theater in order to bring a different type of comedy to classic female literature. It was extremely fun to watch and kept the audience engaged throughout the entire performance. It was a cool show with a strong message and I loved every odd second of it. If you’d like to get in contact with me, follow me on Twitter @abbikxsu and let me know what you thought about You on the Moors Now.